The second issue, New Specialty Chemical Products Development Department, Initiatives for functional polymer | Special Report | Wako Pure Chemical Industries, Ltd.
Our team is primarily engaged in the development of functional polymers. Functional polymer refers to a resin that has advanced functions and is used in special applications. Applications within electronic devices, artificial organs and medical equipment are progressing. As a recent achievement, we engaged in the development of polymer materials for color filters mainly used in LCD panels. 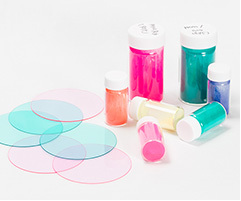 Color filters are manufactured by applying a resin called color resist which mixes red, green and blue pigments and polymer materials on the glass substrate and burning accurate patterns following exposure and developing. In recent years, amid the trend of even higher definition of displays, the formation of finer and more precise patterns is required. Color resist contains an ingredient that hardens when exposed to light. The patterns are formed when only the exposed area hardens and the unexposed area is dissolved and washed away when developing. We designed the polymers so that the exposed area would harden more easily and the unexposed area would dissolve more easily. With this, we were able to meet the requirements of the microfabrication required to achieve higher definition. In addition, by designing polymers with high light transmittance, we were able to contribute to the realization of vivid LCD displays with high brightness. Devoting ourselves to meeting the needs of society. We are also focusing on binders of rechargeable batteries such as lithium ion batteries. Although graphite is usually used in the negative electrode of lithium ion batteries, research is being conducted around the world to replace graphite with silicon. If graphite can be fully replaced, the charging capacity is expected to increase by approximately 10 times. However, the problem is that the volume of silicon expands by about four times during charging and shrinks upon discharging. Since the silicon rapidly shatters as this process is repeated, durability is a major issue. In fact, batteries which graphite has been completely replaced with silicon have yet to be in practical use. To cope with this issue, we are developing a net-like binder, which the molecules of polymer are joined together. We are able to control the breakdown of silicon by placing this binder around silicon particles like a net. 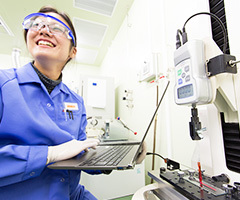 This binder was developed through joint research with universities, and we are currently proposing this to battery makers and other manufacturers. There are still issues to be resolved before it can be put into practical use. We will be examining in-depth where the polymers are placed and what changes will occur during long-term discharging with a view to putting it into practical use in the near future and creating world-leading products in this field. 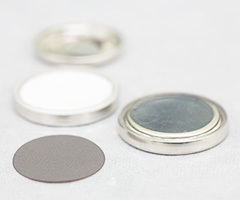 The gray material in front is the silicon negative electrode. Research is being conducted to significantly increase the recharge capacity of batteries. 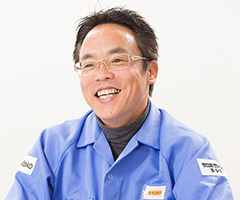 Wako excels at organic synthesis and also independently develops special monomers. An example would be polymerizable dye which adds dye to a polymerizable group. Although colorants could be pigments or dyes, pigments do not dissolve in solvents. If pigments are mixed with resin, for example, there is the problem that the colored resin would lack transparency. On the other hand, since dyes dissolve in solvents, high-transparency colored resin can be obtained when dyes are mixed with resin. However, there is the problem of dyes seeping out from the colored resin. Since polymerizable dyes bind to resin by chemical bonding, almost no color seeps out and vivid colored resin with high transparency can be obtained. Although polypropylene is a resin with high chemical resistance, the color seeps from resin colored with dye when the resin is exposed to chemicals. If polymerizable dyes are used, highly transparent colored polypropylene can be obtained without the color seeping out due to chemical exposures. There have not been such materials before, and we believe that they are suited for applications such as cosmetic bottles. Resin colored by chemical bonding. The colors don’t seep out. In polymer synthesis, slight differences in raw materials, reaction conditions and processing methods can lead to a completely different result. It is extremely difficult to control these factors, and it is a fact that we have relied much on our years of experience and intuition to arrive at the right answer. However, enhancing efficiency also would be an important viewpoint in the future. Accordingly, we will deepen our understanding of the complex structure of the polymers produced and design the selection and manufacturing process for monomer, the material used, by calculating backwards rather than arriving at the required function through repeated trial and error. In other words, an important mission of us, the development team, is to enhance our polymer designing capabilities. We are aiming at development that can make proposals that anticipate the needs of society by joining forces with universities and other research institutions. Copyright (C)2013 Wako Pure Chemical Industries, Ltd. All Rights Reserved.